Parameters= Type of parameters (PARAM_...), IdParameterList, parameter array which goes in the level section of the NG Scripter. In this field you type a PARAM_ constant to describe whivh trigger is the Parameters command. You can see the list of PARAM_ constants in the Reference panel of NG Center program, in MNEMONIC CONSTANTS section. From this (third) parameter starts the parameters used by trigger. The number and meaning of these parameters change in according with PARAM_ type. You can have information about different syntax by referencing the description of specific PARAM_ constant in Reference panel. PARAM_MOVE_ITEM which we will be using for this tutorial. This is a progressive number to identify this "Parameters=PARAM_MOVE_ITEM" command script in trigger window of ngle. You'll type 1 for your first PARAM_MOVE_ITEM command, 2 for second etc. You can set one or more FMOV_ values linked with + (plus) sign. See description in Reference panel to get description of different FMOV_ flags. Remark: you can type IGNORE in this field if you don't wish use any flag. For example, FMOV_HEAVY_AT_END, this could be used if you want to move a static onto a death tile and make it explode using a flipeffect. 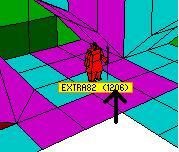 This is the index you can read in yellow frame when you click over an object in NGLE program. Remark: you can use static or moveable anyway but you have to use the correct flipeffect in accordance with the static or moveable nature of the item. About statics, remember statics are owned within the room they are placed and for this reason you should avoid moving statics outwith the bounds of the room. In this field you set the distance of moving. The used units have as reference 1 sector = 1024, hence, 512 is half-sector, 256 is a click etc. I suggest you always use a multiple of 256 (one click) to avoid trouble. The max value you can type for distance is 64512, corresponding to 63 sectors. The speed value is the number of units that will be added to the current position to move the item. The used units are the same as Distance field: 1 click = 256 units. Remember that to this speed will be added 30 times for each second, so it's better to not exaggerate big values as speed. A reasonable speed is enclosed in the range from 8 to 64. Remark: It's advisable to set as speed a value that is a perfect multiple of distance, otherwise there will be a bit error in computing the final distance. Optional. If you wish to play a sound effect in looped mode while the item is moving type a number of a sound effect here. You will find the list of sound effects in reference panel of NG Center, in the section named "SOUND SFX indices list". Remark: if you don't wish any sound type IGNORE in this field. Optional. If you wish to play a sound effect when the item reaches the final position, type a number of a sound effect here. You will find the list of sound effects in reference panel of NG Center, in the section named "SOUND SFX indices list". Study the fields and get familar with what each one achieves. Here is a script command that I have used to move a knight. You can also see it in the pic above. Remark: If you type ; at the end of a script entry, the NG Center will allow you to type anything you want after that. As you can see I have ; Knight 1, it's just handy to keep track of things if your script get's realy long! If you were to use this command, you would have to change the "1206" as that is the object ID of my knight. All you have to do is replace this with the id of the object that you want to move. While you're at it you can take a look at other flipeffects to see what can be achieved through the parameter command. That's it! Trigger your flipeffect and check out the results. Have fun experimenting with all the different fields for this command.